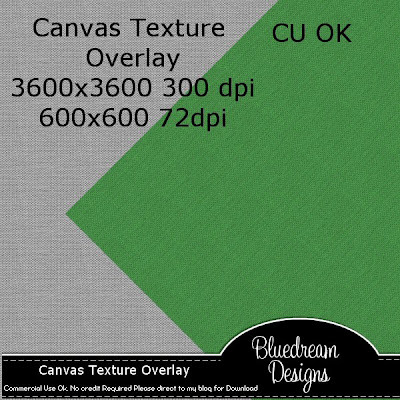 Bluedream Designs: CU Textured Overlay freebie. I did make this textured overlay that I thought some of you scrappers may find useful. Love this overlay, thank you for sharing it! LOL Yes, I agree...the week between Christmas and New Year's seems to blend into one loooong day! Very nice of you to shave the overlay. I was reading about finding your kits being illegally shared on 4shared. I understand how you feel. I found one of mine there last week. She had actually pulled it apart and uploaded each piece separately. When I contacted 4shared, the removed the links. When I contacted the pirate via the message system, she gave me some silly, unbelievable answer. Sometimes we just have to let things go. The honest people will buy, but those who want something for nothing and have no conscience, will continue to steal. We just have to leave them in God's hands to deal with. Thank you for sharing! Have a very happy new year! Love the texture to this - THX so much! Thanks for the awesome overlay...I like to add texture to my BG papers! I hope you have a prosperous and Happy New Year! Thanks for the overlay! Happy New Year to you, sending lots of Health and Happiness your way! Thank you so much for this Freebie. I want to let you know that I posted a link to your blog in Creative Busy Hands Scrapbook Freebies Search List, under the Overlay(s) post on Jan. 01, 2009. Please, notice that I've changed my url. Thanks again and Happy New Year. Thanks so much. These two holidays do just seem to run into each other. I just love it! The family has a lot of time off and we just get to be together a lot! Your mojo may just be taking a break from the frenzy of the holidays. :) I'm sure it will be back bigger and better than ever! Soon!